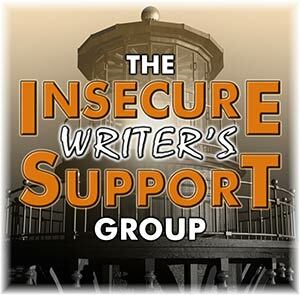 IWSG was created by the amazing Alex J. Cavanaugh. Click here to visit the other participants. July's co-hosts are Yolanda Renee, Tyrean Martinson, Madeline Mora-Summonte, LK Hill, Rachna Chhabria, and JA Scott. On July 1, 2015, I decided to apply my exercise goals to my writing. Basically, I would write for so many minutes a day, which started at a mere twenty-two minutes a day and built up to forty-five minutes by November 2015. A leap year later, I now have the results of writing a bit a day, every single day. The only writing words I counted included original fiction and outlines. From July 1, 2015 through June 30, 2016, I wrote 326,642 words. I completed the first drafts of Marked (26,095 words), The Mission (21,530 words), Forged (73,997 words), "Folds in Life and Death" (6360 words), "On Day 168" (7899 words), Determined (14,588 words), A Soul to Kill (40,908 words), and A Soul to Protect (14,349 words). I wrote the outlines to Destined (5248 words), A Soul to Kill (719 words), A Soul to Protect (1115 words), and A Soul to Reap (8886 words). I'm still working on the novels Destined (87,431 words) and A Soul to Reap (17,517 words). 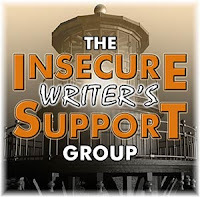 July 6's IWSG question: What's the best thing someone has ever said about your writing? My answer: A reader and fellow author said she read my book (95,000-word novel) in one evening/night. I remember doing that with the Harry Potter books and to think someone read my book like that, it blew me away. I can't believe we're halfway through the year already. I'm so close to finishing Destined, the last book in The Fate Challenges series, and I'm making progress in A Soul to Reap. I also finished editing the stories for the upcoming Untethered Realms' anthology Ghosts of Fire. Edited: Of course, last night (July 5), I realized I need to change things in A Soul to Reap. The best course of action is to rewrite A Soul to Kill and then modify my outline in A Soul to Reap before going back to it. Finish writing Destined. At thirty forty-five minutes a day, I should finish Destined soon. Continue writing A Soul to Reap. Rewrite A Soul to Kill. Once I finish Destined, I will spend forty-five minutes a day on this short novel. Edit "On Day 168." My story for Ghosts of Fire is due to the proofreaders in August. Parallels: Felix Was Here explores the realms of alternate history and parallel universes in ten short stories. In the title story "Felix Was Here" by L.G. Keltner, Betty learns her idyllic city has some serious secrets. What I loved best was how Keltner built in Betty's memories of Felix and her need to find if he was real or not. Harper tumbles into a parallel universe where the rain has deadly consequences in Sandra Cox's "Rainers." I enjoyed the chemistry between Harper and Noah as well as what an alternate United States might look like. "Rainers" is a frightening and pulse-quickening tale that will lead the reader in suspense. In "WIN," Sylvia Ney explores the cost of technology as young David must teach those without the WIN system how to function in the world. I loved how Ney shows how learning is still so important, even with information at our fingertips. Michael Abayomi's "Ground Zero" shows the aftermath of a nuclear bomb. The abilities Elijah has intrigued me, and I would love to read more. Quinn discovers what unplaceable really means in Yolanda Renée's "Ever-Ton," a chilling, post-apocalyptic story. I loved the world building jammed pack in this short story. In "Folds in Life and Death" by Cherie Reich, Tecumseh's curse claims Allyson's brother, and she's left to pick up the pieces. I can't judge this story fairly because I wrote it, but if you like origami magics and alternate history set in 2001, then you might like it too. A drug trial goes awry in Hart Johnson's "The Seventeen." Johnson tells quite the horrific tale with such a unique take on a drug that's contagious. Virtual reality has real life consequences in Tamara Narayan's "Scyring the Plane." This story has me rethinking how awesome virtual reality sounds, and I really felt for the family's slow internet problems. Narayan nailed the teenage voice too. In Melanie Schulz's "The Haunted," Andy can't escape the feelings of nothingness, even though she doesn't understand why. This ending of this story made my skin break out in goosebumps and was quite the haunting story. I enjoyed every single story in Parallels: Felix Was Here and recommend the anthology. 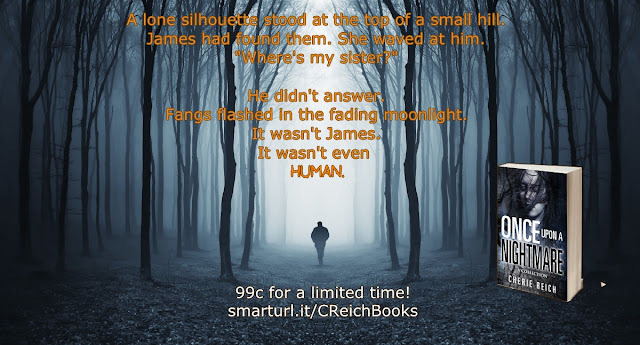 Once upon a Nightmare: A Collection is 99c for the month of July! A total of 326,642 words? Amazing! Congrats! Reading a 95,000-word novel in one sitting means the reader was totally hooked! What a wonderful compliment! WOW!!!! Now that's an fabulous compliment!!!! Holy cow that's an amazing year you've had!! I'm SO impressed that you really stuck with it every day. Congratulations! Such an accomplishment. And congrats on the reader who read your book in one sitting too. Hard to top that for a compliment! Love that you've kept track. I did that once and realized the millions of words I've written, and re-written and it's mind boggling. But I love this time dedicated to writing - I'll have to give it a try! Great job! And such a lovely review of Parallels! Thank you! Wow you've written a lot of words - and stories! I'm impressed. To have someone devour your book so quickly is a really great compliment. Wow!! So impressed! I'm heading towards my most prolific year ever, but it's not gonna be anywhere near 300k+ words :) I'm almost finished with the first draft of Vengeance and Vermouth, the 3rd Zyan book, and once I do that I'll be at about 140k for the year. I'll probably hit 200k before the end of the year. My goals for July are to finish that, plus finish the first major round of edits on it. Thanks for adding me to your release list, BTW! I like your review of Parallels. Now you know why I placed Melanie's story at the end. Here from Alex's blog. I think it means so much when a reader enjoys our work. One comment can add so much value to the blood sweat and tears it took to create a work of fiction. Congrats on such a nice compliment. Best of luck with your next novel. And knowing there's a reader who read your entire book in one sitting has got to be a fantastic feeling. I've only ever done that for the last four Harry Potter novels and one John Green novel. The most words I know I've written in the shortest time was a 406K first draft I wrote in five months (now down to 398K and still slightly shrinking). I also wrote a 398K first draft in three months, and a 891K first draft over two years, four months, one week, and one day. 326,642 words is staggering and amazing. Having someone read your work overnight is awesome. Congrats. I'm following in your footsteps. Although, I don't write every day, I write most days. Some days more than others. It's usually when I have to stop and think about where the story is and where I want it to end up. You're a terrific writer. You deserve lots of nice things said about your stories. I always enjoy them. I love your word count. It is really amazing. Yes, the year is going by quickly. I can't believe it is July also. I started revising my manuscript so that I can return it to my writing coach/book editor. I plan to start the submitting to agent process in September. Wow, you're really rockin' the word count. Great job! Keep it up! Happy writing. If I read a book in one day, I definitely enjoyed it and couldn't put it down. That's a great compliment. "every single word adds up"-- yep. and as you said-- then those words have to be cut down! All the best with your goals, writing, and otherwise! Wow, this post is loaded!! And, I did like your story in Parallels. I think I only have two stories left to read, then I'll review it. I'm hoping someone will one day read my book all the way through in one sitting; and not just cuz its short, lol. You're so disciplined. I admire that because I'm just the opposite. Loved what your best comment on your writing was. That is a best compliment, indeed. You are crushing 2016! Congratulations!! What you've accomplished is really impressive. Send some of that mojo my way. And that is an awesome compliment about your book. I started reading Reborn, and am enjoying it immensely. You should be proud of it. Congrats on getting so much done! That's impressive! It's true, those words add up! It's exciting that someone gobbled up your book like that! Wow! I'm amazed at how words add up, and I love reading your word counts and all that you've achieved! Awesome compliment! She read it all in one sitting! Wow, that's an impressive amount of words for just a single year. Congrats! Hopefully editing all those words won't end up being too troublesome for you, LOL.